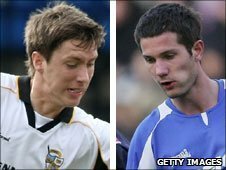 Defenders Mark Phillips and Luke Prosser have become the 13th and 14th players to agree pre-contract deals with Southend United. The pair will join the club once their transfer embargo has been lifted. Phillips, 28, spent seven years at Millwall before signing for Brentford in 2008 and being released in May. Prosser, 22, was released by Port Vale this summer after spells with Tottenham Hotspur, Leigh RMI, Salisbury City and Kidderminster Harriers. Meanwhile the Shrimpers have yet to make a decision on trialists Rene Howe from Peterborough and Plymouth defender Chris Barker. Barker has been told he has no future at Home Park and was given permission to play in Southend's pre-season game against Eastbourne on Saturday.